"The first non-sellout means the Minnesota Wild organization has to do better, both on and off the ice, in everything we do. Our team this season will work hard to earn your support; we'll be better. We know, when a new sellout streak begins, it will be because we've earned it." ... and spent $196 million on two premier free agents. Leipold won't have to worry about writing any more apologetic notes to fans any time soon. After signing Zach Parise and Ryan Suter to identical 13-year, $98 million deals on Wednesday, the State of Hockey has seen its fever rise for the Wild with tickets and merchandise flying off shelves. About 850 season tickets were sold in the hours after the signings were announced and the total is up to 1,500, according to Mike Russo of the Star Tribune. Many of the seats sold, Maher said, have been the higher-priced seats in the lower bowl of the Xcel Energy Center. The Wild's team store in the arena has sold more than 200 Parise and Suter jerseys, when selling a handful of hockey sweaters would be typical on a July day, [team spokesman Ryan] Stanzel said. With all of this marketing momentum in just a few short days, it's already been asked whether or not a Winter Classic in Minnesota's future. It would definitely be a huge hit in the state, whether held at TCF Bank Stadium (football) or Target Field (baseball). The question would be if this new-look Wild team, now headlined by two American stars, would have a positive affect on television ratings nationally on NBC. As Kevin Allen of USA Today wrote in 2011, the Winter Classic is an exclusive club. Teams like Detroit, New York, Pittsburgh, Chicago, Philadelphia, Boston have driven ratings nationally for years, which is why they've been selected -- sometimes twice -- in the past. So if a team wants a seat at the Winter Classic table, they need the right credentials. The Wild are on the brink of that at the moment armed with star power and a great history of hockey in the state at all levels, but with four straight seasons of playoff-less hockey, the momentum from this summer will need to translate into wins and interest nationally if they're to finally get an outdoor game. The local ratings have been consistently strong for previous Winter Classics and Stanley Cup Finals, but that's not earned the Wild a regular spot at NBC's table. 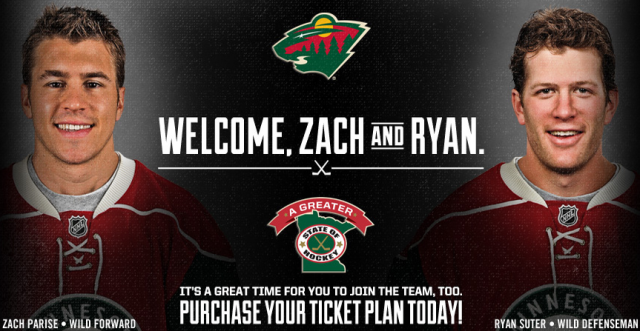 But the Wild have far more pressing matters than landing a future Winter Classic. The franchise needs a quick turnaround to help capitalize on the tremendous amount of excitement from this past week. Now, the real proof will come when we hit the ice this season. But, I am confident that we have taken a huge step forward today. It's high time that the fans of the State of Hockey are rewarded with playoff success. The expectations are now in place for the Wild. WIll they be able to meet them?